We provide a domestic waste removal service that is reasonably priced, quick, courteous and efficient. Our polite, uniformed staff will arrive in one of our fleet of 3.5 tonne cage trucks to load all of your rubbish away to subsequently for reuse and recycling. Operating all over London and the home counties, the General Waste domestic waste disposal ensures that over 85% of the rubbish collected is recycled. A BETTER DOMESTIC WASTE REMOVAL SERVICE. We collect anything from single item to a full house clearance. You only pay for the space you use in our vehicle. Our domestic junk collection is an easy and eco-friendly alternative to skip hire. The crew will remove all types of waste, ranging from furniture and electrical appliances to garden refuse. 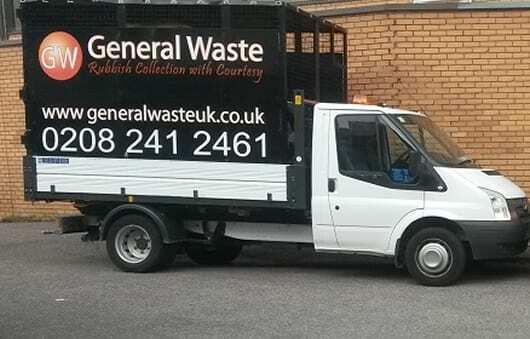 General Waste can also remove materials from all areas on a property so we are always happy to provide a no-obligation quote before proceeding. Unlike a skip or a hippo bag, the customer will only pay for the rubbish cleared, so they don’t need to estimate the size of a skip or hippo bag beforehand.